The 1929 building, with a 1931 addition, has been vacant since the AMEX closed in 2009. On June 12, 2012, Landmarks held a public hearing on the potential designation of the New York Curb Exchange Building at 78 Trinity Place in Lower Manhattan as an individual City landmark. The origin of the building’s name, which was once known as the New York Curb Market, dates to the mid-1800s when stocks and securities were traded on the streets of the Financial District by “curbstone traders.” The original Starrett & Van Vleck-designed building was completed in 1921 and faced Greenwich Street. Despite 1929’s stock market crash, a 14-story, Art Deco addition was built facing Trinity Place in 1931. Also designed by Starrett & Van Vleck, the addition features metal reliefs depicting the types of commodities traded, and a set-back crown with large windows and free-standing piers. The Curb Exchange was renamed the American Stock Exchange in 1953, and it merged with a group headed by the New York Stock Exchange in 2008. The building has been vacant since 2009. Attorney Valerie Campbell, representing the building’s owner, testified that the owner was amenable to landmarking. Campbell said the owner planned to reuse the building for commercial and retail uses. Mary Dierickx, representing the Citizens for Downtown, noted that the building had already been designated a National Historic Landmark, and called it a “powerful visual reminder of the rise of the American financial industry.” Representatives of the Historic Districts Council and the New York Landmarks Conservancy also spoke in support. LPC: New York Curb Exchange Building, 78 Trinity Place, Manhattan (LP-2515) (June 12, 2012). 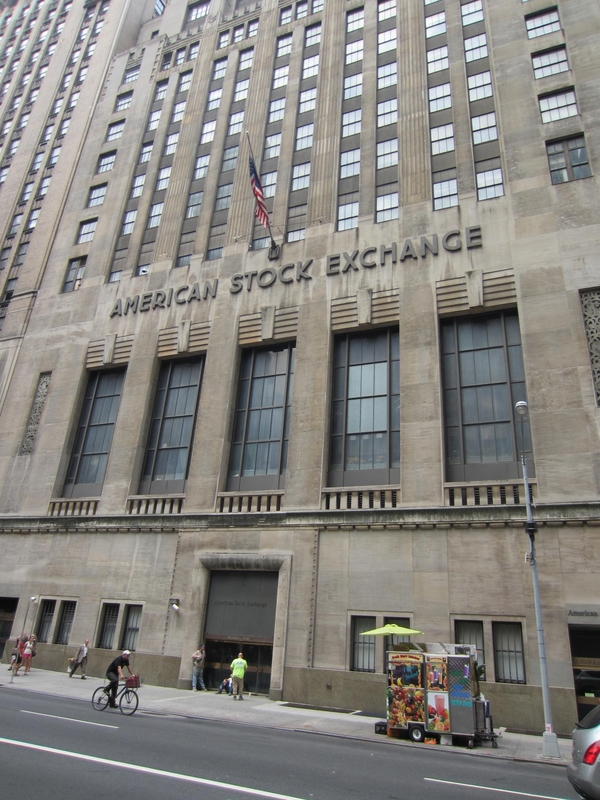 Update (7/9/2012) – Landmarks designated the New York Curb Exchange Building as an individual City landmarks on June 26, 2012. Read the designation report here.